We all have those neighbours who never say hello in passing, keep their curtains drawn at all times of the day and generate weird noises straight out of a creepy horror movie. 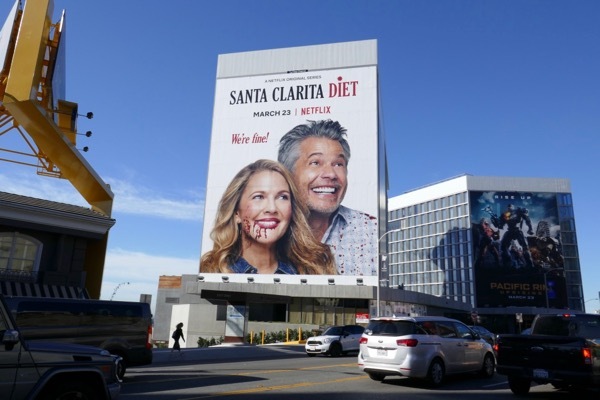 Sadly some of us even have those seemingly normal neighbours that keep their kids chained up indoors, or we discover they've got a secret basement in their backyard with abducted women trapped inside, and more bizarre scenarios. 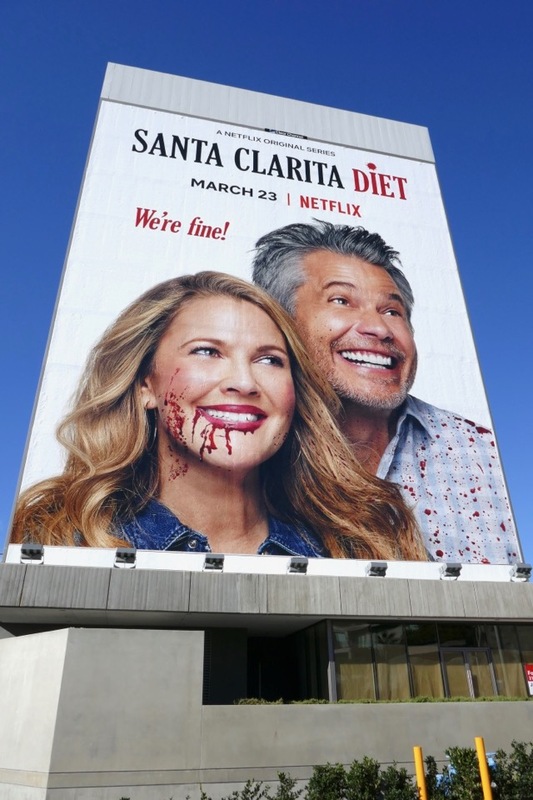 How many people can claim to have a flesh-eating zombie for a neighbour, though? 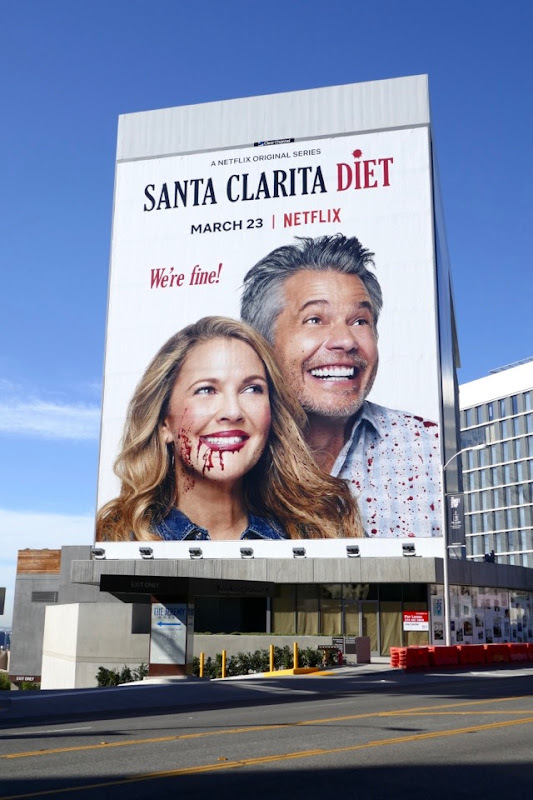 Drew Barrymore and Timothy Olyphant return for the sophomore season of the Netflix dark comedy, Santa Clarita Diet, about married Southern Californian real estate agents whose sunny disposition hides a big secret, she's undead with a craving for human flesh and he's her enabler. 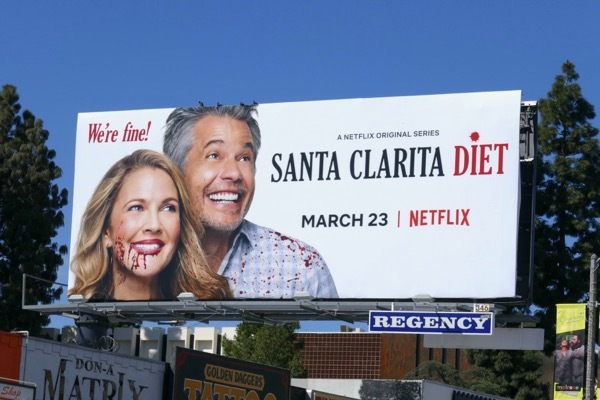 These 'We're fine!' 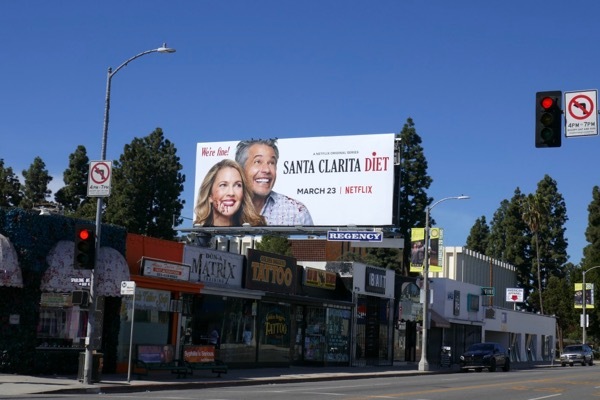 season two billboards were snapped along Melrose Avenue, Highland Avenue, Beverly Boulevard and the Sunset Strip from March 7 to March 15, 2018. 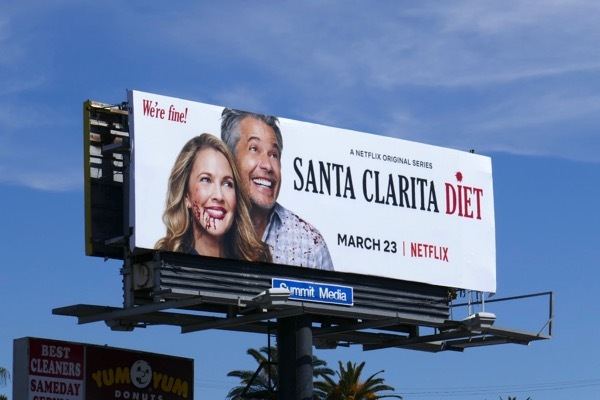 Fans of the show can also enjoy these gruesome tongue-in-cheek series launch billboards for Santa Clarita Diet, that featured severed arm burritos, raw heart burgers, finger fries and juiced blood and guts (the outdoor ad campaign even won a BAB Award for its originality and attention-grabbing qualities). 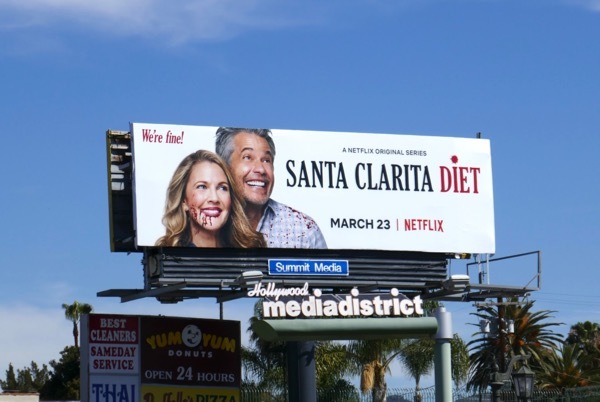 Drew Barrymore fans can also check out these Going the Distance billboards and these Blended movie billboards. 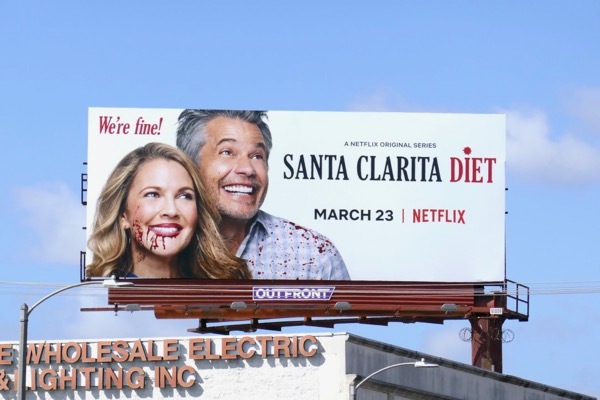 Meanwhile Timothy Olyphant admirers can enjoy all these Justified TV series billboards. You may not be able to choose your family, but you certainly have a choice about who you live next to. Remember, choose wisely, or your neighbours may end up having you over for dinner, quite literally. 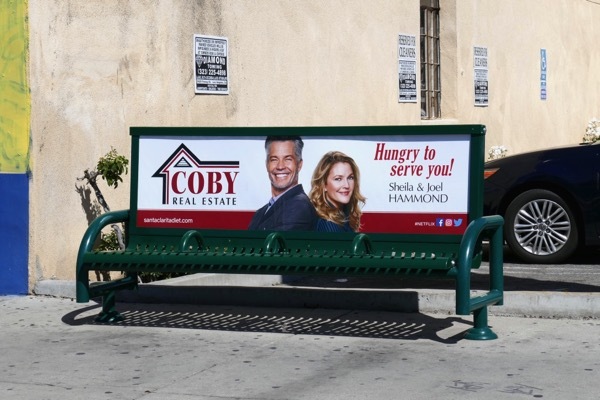 UPDATED: Here's also a witty faux Coby Real Estate bench ad for the show spotted along La Brea Avenue on March 26, 2018.